New CS Scribblers Interest Check 🖌️ + Raffle! 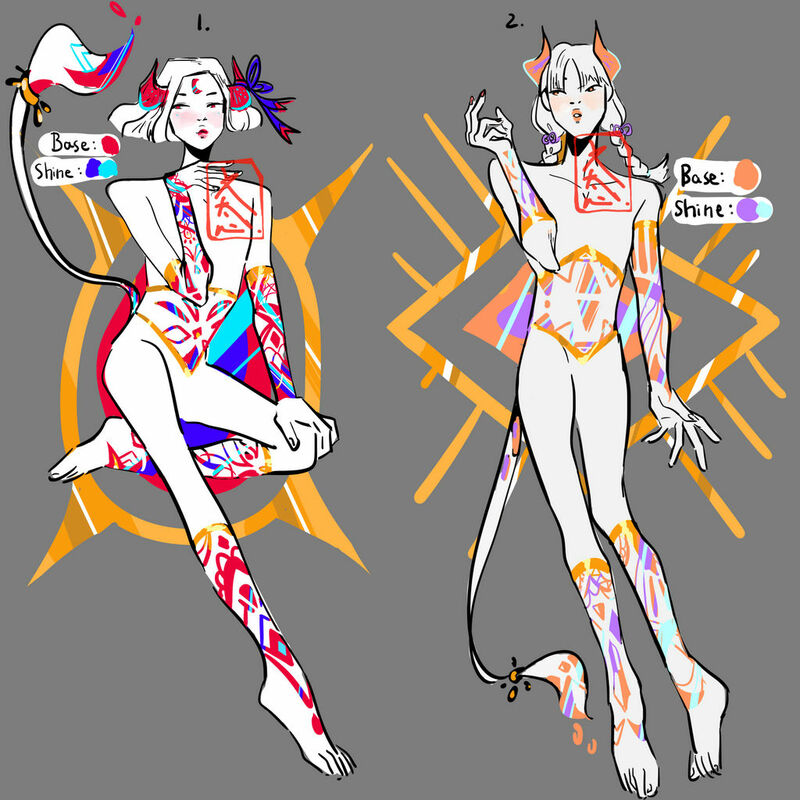 Scribblers are magical beings with colourful tattoos on their skin (limbs and abdomen), which earns them their name. Their skin is textured like paper, most commonly matte, and their skin colour is usually white or a light grey. Their tattoos are what they rely on to channel their magic, so the more tattoos the more powerful the Scribbler is. A Scribbler's tattoos grow in as they age, but they're not infinite, a gold band termed a limiter will gradually grow in, stopping the growth of tattoos and limiting magic prowess. Most common Scribblers have their limiters around the knee/elbow area on average with one or two breaching onto the upper limbs, but there are rumours of some with all upper limb limiters or even no limiters at all. These tattoos are all one base colour, but when light shines on them they shine in a different colour, creating a unique iridescent image. Their tails can be used to write with their base colour, like inkbrushes! 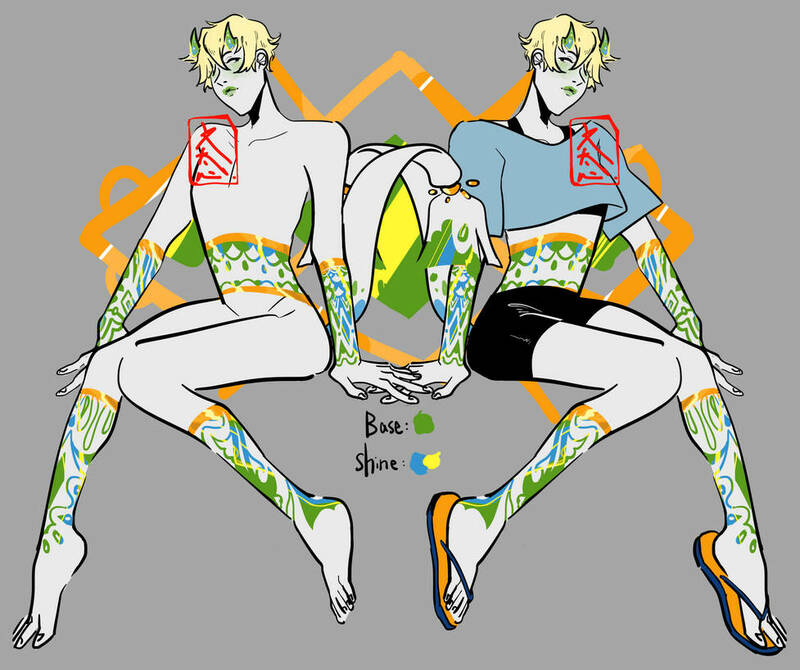 They tend to accessorize and dress according to their colour scheme as well, and generally dislike completely covering their limb tattoos, as they're a show of power. Currently I don't have a species/trait sheet for them yet, but I don't have any projected rarities except for unusual skin colours + limiter positions. If you have any suggestions please feel free to let me know! Oh, they're pretty! I love your art style. these look really promising! i love eye-popping colors and will definitely keep an watch on this species. i'd just like to ask if the horns serve a purpose or are they merely decorative? sorry if i seemed to miss something! Thank you for your interesting and UHHH for now they're just decorative but I'm still in the super early stages of development... They might have a purpose/lore behind them in the future but for now no! Oh that's an interesting concept, thank you for the suggestion I might think on it!